First published in an eight-volume print edition in 2008, and reprinted in 12 volumes in 2012, the African American National Biography now includes over 5,000 brief (500-5000 word biographies) of eminent and historically significant black Americans. The earliest subject is Esteban, the first African known to set foot in North America, to the present day Williams’ sisters in tennis. The AANB includes living figures, a decision that greatly expands the choice and coverage of available subjects, but also requires constant editorial updating online. For Black History Month, entries from Oxford University Press’s African American National Biography (AANB) have appeared weekly on The Root, an online magazine of African American culture an politics. 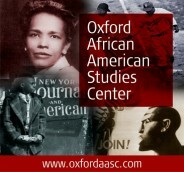 The Root’s Editor in Chief, Henry Louis Gates, Jr., of Harvard University is also Editor in Chief of Oxford’s African American Studies Center, which includes the online incarnation of the AANB. Here, Steven Niven highlights four remarkable black lives that feature on the site. Given the scope and the length of time I’ve been working on the African American National Biography (over 13 years and counting), selecting just a few biographies that were somehow “representative” of the overall project would have been an impossible task. Instead, working with The Root’s managing editor, Lyne Pitts, I chose four entries that showcased some of the diversity of the collection, but focused on hidden or barely remembered figures in black history. Shorey’s biography is in many ways a classical 19th century tale of individual courage. Born the mixed race son of a Scottish sugar planter and a Barbadian woman, and with dwindling economic opportunities for people of color in the Caribbean, he left for New England in 1870. There a long tradition of African American whaling offered him a chance to rise through the ranks and by courage, hard work, and luck—he nearly drowned on an early voyage—came to command his own vessel in his twenties, by which time he had moved from the frigid North Atlantic whaling grounds to the more temperate Pacific coast, based in San Francisco. Bentley offered a rare opportunity to examine the life and career of an openly lesbian woman; our 5,500 biographies undoubtedly include a significant number of subjects whose sexual identity is unknown. Although a pioneer in the 1920s and the early 1930s—even famously claiming to have married a white woman in New Jersey–by the end of her career in the 1950s, Bentley proclaimed that she had been “cured” of her homosexuality by a combination of hormones, psychotherapy, and faith. Like all of us, Gladys Bentley left behind fragments of her words, performances, and acts. The challenge for the biographer is to patch the fragments together, summarize them as accurately as possible, and connect the individual life to their broader time and space. Gladys Bentley’s biography, for example, certainly contrasts the relative sexual freedom of the Harlem Renaissance in the 1920s with Cold War conformity—and the same could be said for contemporaries like Bayard Rustin, the gay architect of the 1963 March on Washington. 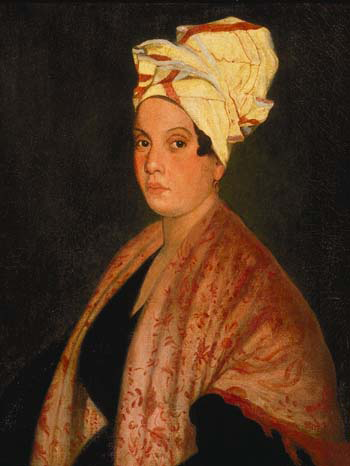 1920 painting of Marie Laveau (1794–1881) by Frank Schneider, based on an 1835 painting (now lost?) by George Catlin. Louisiana State Museum, New Orleans. Public domain via Wikimedia Commons. Unlike Shorey and Bentley, Laveaux, is hardly a figure “hidden from history”; after all her grave is allegedly the second most visited in the United States, after Elvis Presley’s. But her life (and after life) has been shrouded in so much mystery and confusion over the role and meaning of vodou that Marie Laveuax’s actual biography is often lost, like the last letter of her name, which is nearly always given as Laveau. Adapting this entry, written in 2004, also served the purpose of updating the historical record. New evidence shows that the father of Marie’s three daughters was white, and not a free man of color as most biographies have stated, including our own. Thankfully, such corrections can easily be updated online. As a former slave and pioneering member of the first black political generation, Charles Caldwell allows us to see both the democratic and revolutionary potential of the Reconstruction Era, and the chilling violence that prevented the full enactment of those ideals until the Second Reconstruction after World War II. Mississippi’s white Democrats fought hard to maintain the political supremacy they had won by defeating Caldwell and the Republicans in 1875. The response to the biographies on the Root website, Twitter feed, and Facebook page, has been overwhelmingly positive. The series will now continue into March, featuring four additional African American National Biography entries on notable black women for Women’s History Month. Headline image credit: New Orleans, sketched from the opposite side of the river upon a mast of a vessel during a very low water / sketched in October 1839 by S. Pinistri, arch’t. and civil engr. Library of Congress.